Notes: I received this ink for Christmas (I asked for it) and I couldn’t have been happier opening it up. 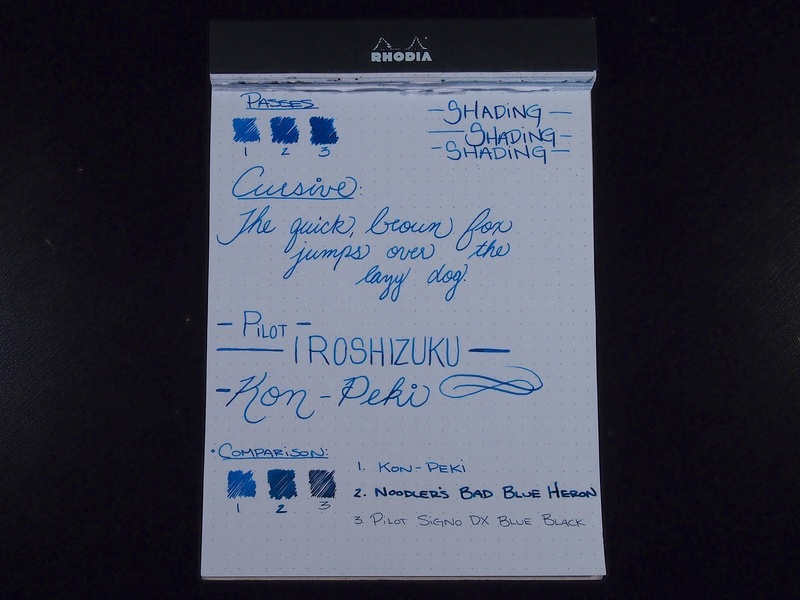 I have tried out a few Iroshizuku inks before and liked their overall performance, the colors, and their presentation. The ink comes in a very minimalistic box that’s silver with a block of color that matches the ink. Open the box though and this is where the real fun stuff starts. The bottle is absolutely beautiful. It is slim in width, but has a taller and wider profile than most of my ink bottles. It has a great textured paper label with very minimal print on it. There’s a silver cord tied around the neck of the bottle which just adds some class to the overall appearance. A nice bottle is great to look at, but it’s even better when the ink inside is just as nice. 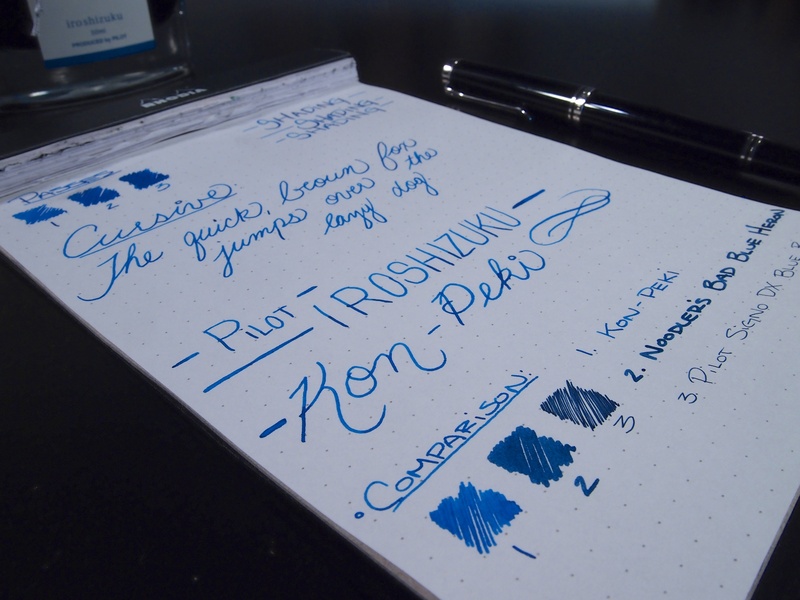 Kon-Peki is a vibrant blue with lots of shading qualities. It dries nice and fast. 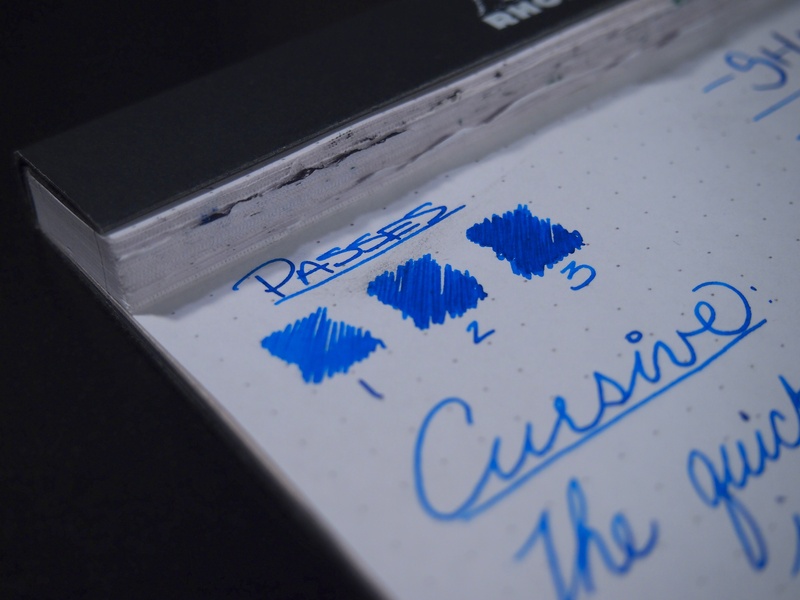 So far I’ve had it in my new Lamy 2000 and the Pelikan, and it was great in both. The color pops without being obnoxious and I’m glad I have an entire bottle. 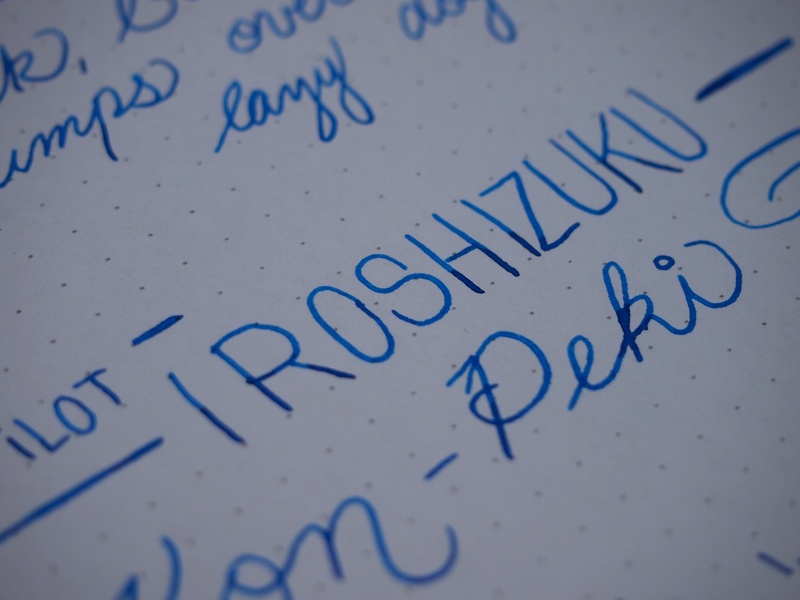 The Iroshizuku line doesn’t come cheap at around $28.00 US per bottle, but I think it’s worth it. I also received a bottle of Fuyu-Syogun as a gift from my girlfriend. I didn’t even have to ask her for it, she just happened to pick it out. I’ve gone through three samples of the Fuyu-Syogun and had been debating a bottle for a long time. Check back soon for a review of that! P.S. – Just a reminder, I am taking submissions for your Weekly Loadouts!  If you want to share what pens, ink and paper you’re using this week/month/whatever, please share! The flow and shading of this ink are great. At first, I thought it was a bit watery. After writing some more and noticing the quick dry time with the wonderful shading, all negative thoughts went away. This ink can be built up on the page. With three passes it darkens up nicely. Close up of the shading test. This stuff would really shine in a broader nib. I can’t wait to get some in my 3.8mm Pilot Parallel. 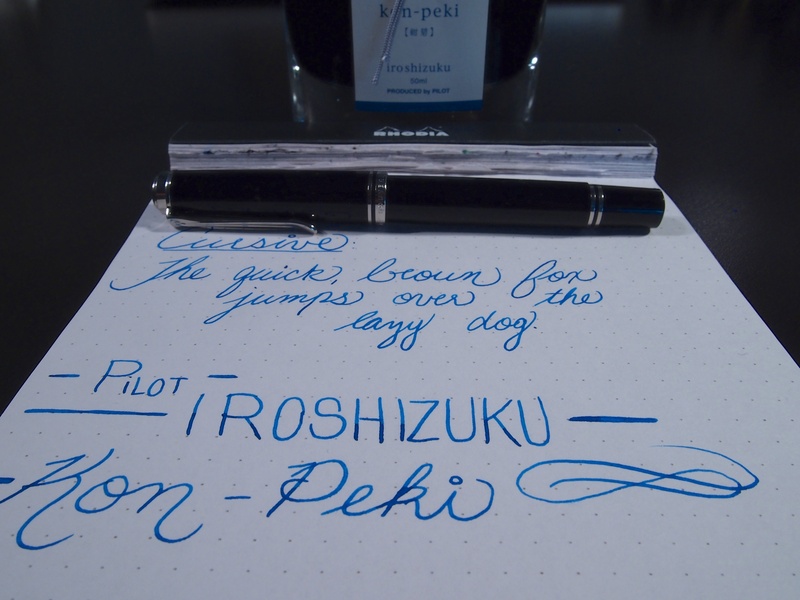 Rhodia dotPad, Pelikan M605, and the bottle of Pilot Iroshizuku Kon-Peki. A wonderful combination. 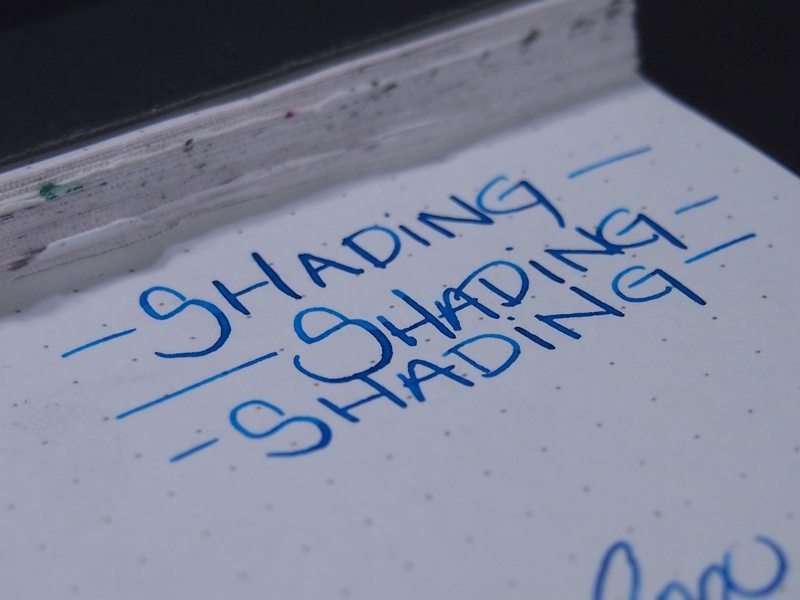 This just looks like an all around gorgeous combination, and I dig your handwriting, too. If I had to be stuck with one pen, one type of paper, and one ink, this would be a fine choice. It’s a great combo, thanks! I definitely wouldn’t mind being stranded on a desert island with only these three items. 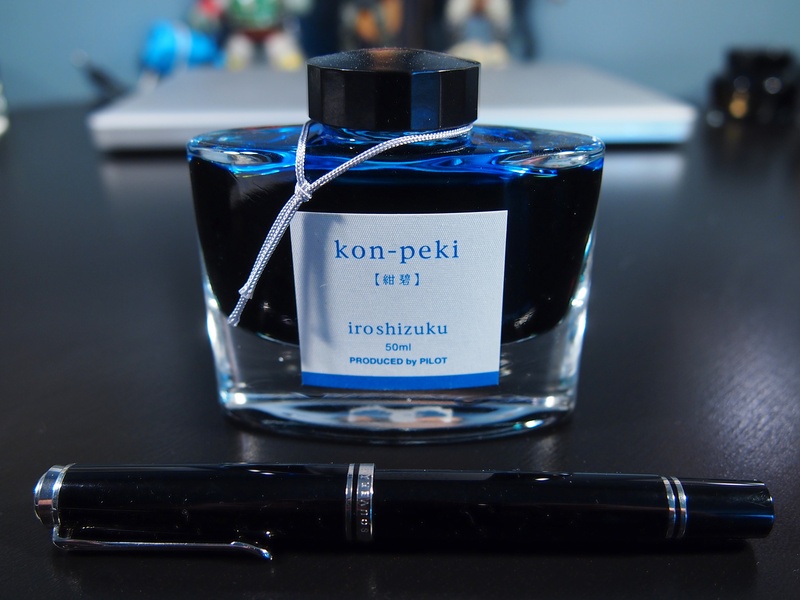 The kon-peki is moving quickly up the ranks as one of my favorite inks the more I use it. 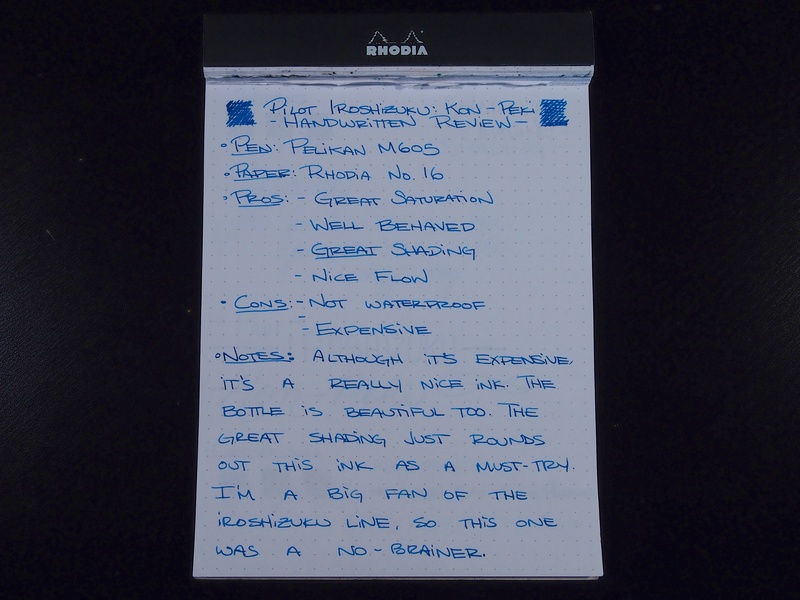 This is such a beautiful ink, great review! I had both this and Ku-jaku in my shopping cart knowing I had to choose one, and Ku-jaku won. Thanks! Ku-Jaku was also on my radar. I wanted to try a sample of it before committing to an entire bottle though. It seems really nice, and I love shades of blue-green.